For those of you that follow me on Facebook, you know that I was luckily enough to be invited to a very VIP event prior to the opening of the Tesla Motors gallery in Boulder this past Friday evening. Elon Musk (co-founder of Pay Pal and CEO and major investor in Tesla) is a committed guy and very well-spoken. He fielded questions from a small, but influential group of people with aplomb, converting technical questions into easily understandable answers that not only provided digestible technical information, but showed his passion for the brand. Furthermore, he was very approachable at the individual level and I enjoyed the few minutes that he spent speaking with me. 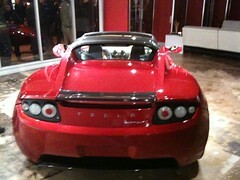 Tesla currently only produces their roadster and the sedan is still a couple of years off. All of the profits from the sale of the roadster are plowed back into the development of the sedan -- they are using a limited production, expensive showpiece to fund mass market vehicles, so everyone that purchases a roadster becomes an investor. Colorado currently offers a $40K+ tax rebate that, combined with Federal tax incentives, brings at total of $50K+ in rebates, provided that you receive delivery of the vehicle by December 31, 2009 in Colorado -- this is a pretty powerful motivator as it cuts the price of the roadster by about 50%. Tesla did receive $400mil+ as part of the whole bailout program, but Elon claims that they have not experienced any problems with government involvement from the investment; the "problems" that they have with government entities are the strict regulations and "hoops" they have to jump through to be able to sell the cars as drivable in the Unites States. Repairs for Tesla automobiles are currently performed by "Repair Rangers" -- basically the repair guys make house calls at the price of $1 per mile for travel plus the cost of repairs. Tesla is not only manufacturing their own vehicles, but also providing electric drive trains to others, notably the forthcoming ElectricSmart. The timelines for production are considered "impossible" by normal automakers -- their cycle for the sedan is 3 years from concept design to production. Individual consumers cannot purchase "beta" models of new production automobiles, but those that put down deposits on the forthcoming sedan will be invited to take rides in pre-production models. In talking with representatives of EV cell manufacturers and other alternative energy source manufacturers, you truly could, given enough money at this point, install a solution in your home that would power your Tesla with no fossil fuel required. The environmental manufacturing cost of vehicles, according to Elon, with some exceptions, is roughly equal to the retail cost, so the environmental manufacturing cost of a Tesla at around $100K is about the same as a $100K Lotus. Tesla aims for 5-star crash ratings for all of its vehicles, and those ratings get harder to achieve each year. The cars themselves are gorgeous and are made for Tesla by Lotus, so they are similar in size to the Lotus Elise, though the cockpit seems a little bigger and there are definite exterior and interior design differences. 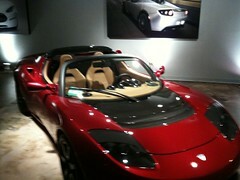 Fully loaded, the Tesla Roadster Sport will run you about $150K and it looks fast just sitting still. Due to the nature of the engine and drive train, the Roadster Sport does 0-60 in 3.7 seconds (they actually were postulating that it did closer to 3.5-3.6 seconds in the higher altitude due to the thinner air and drag; the altitude has no effect whatsoever on the engine performance) because every bit of torque is available from the second you hit the gas. PS -- the food and space at The Kitchen in Boulder was spectacular and I was glad to meet Kimbal, the Chef-Owner and Elon's brother; I look forward to returning for a great meal. PPS -- If you want to schedule a test drive in Boulder, call Tony Longhurst at (303) 440-3758 and he'll take care of you. PPPS -- If you have been looking at buying one of these and want to chat about me purchasing one on your behalf prior to December 31, drop me an e-mail as I am a Colorado resident eligible for the tax incentives. I've worn Focus Night and Day contacts without significant problems for a number of years; basically since they came out. This past August I went in for my Colorado state-mandated annual prescription review for contacts and was informed that Ciba Vision, owner of the Focus brand, had "improved" the Focus Night & Day line by taking the same lens, coating it with some sort of fancy, buffered coating and by adding a tint and lettering on the lens that said "ok" if the lens was in the correct position (i.e., not flipped the wrong way). I popped in the new sample lenses at the optometrist's office, they seemed fine, and so I ordered a year's worth of lenses. That's when the problems started. Never before had I really needed to remove my lenses to clean them, but it seemed like I had to do it daily; never before had I had a problem sleeping in my lenses, but I was waking up needing to clean them. Although it seemed like some of the itching and burning in my eyes may have been allergy-related, I've never really had allergies, and when I removed my contacts, the symptoms seemed to almost immediately disappear; it got to the point where I was either carrying a contact lens case with solution or throwing lenses away when I was at work because I couldn't take the irritation. Finally a couple of weeks ago I decided to take a break from the lenses and even went to see if I was a candidate for laser surgery as I had promised myself that if I could no longer wear extended wear lenses, I would get the surgery. While I was at the laser eye surgery consultation answering questions, the assistant asked if I had any problems with the AIROPTIX because there apparently were massive problems with the lenses and that Ciba Vision was aware of the problem and exchanging lenses. I immediately called my optometrist and he confirmed that there were issues, Ciba was aware of the issues, and that Ciba would exchange out the AIROPTIX for stock of the old Focus Night & Day with no questions asked. Furthermore, he offered me a couple of free pairs of Bausch & Lomb PureVision lenses along with a prescription for those -- PureVision is the Buash & Lomb extended wear lens. Stop wearing the lenses immediately. If you think you have an infection or some other negative effect from the lenses, call your optometrist immediately. Call your optometrist that wrote the prescription -- chances are that they are aware of the issue and can get your lenses switched out by their Ciba rep. Chances are also good that they may have some samples of the older Focus Night & Day lenses that they can give you until Ciba gets you new lenses. Ask your optometrist to give you some samples of PureVision. I'm sure that Bausch & Lomb is loving that Ciba has screwed this up and is loading up optometrists with extra samples to convert customers. Should your optometrist be unwilling or unable to help you, call Ciba directly as they are aware of the issue -- (800) 875-3001. Those of you that have not lived in LA, and perhaps those of you that don't or didn't spend much time on the Westside and around Santa Monica, have probably never heard of Bay Cities Deli. The Deli is right on the corner of Lincoln and Colorado, just North of where the 10 hits Lincoln. Most of the time the parking lot is packed and on weekends they actually have someone in the parking lot to direct traffic into parking spaces. Inside, Bay Cities is packed and cramped and full of fabulous food items from their cheese selection to their bakery to their wine selection to, of course, their deli. As you would expect, considering the word "deli" is in their name, Bay Cities has an incredible deli. You will not find better meat products, prepared foods, and salads; every meat to be sliced in the case if it is not some sort of custom product, is a Boars Head product. Of course, with all of the fabulous bread, cheeses, and meats, Bay Cities puts together some amazing sandwiches. 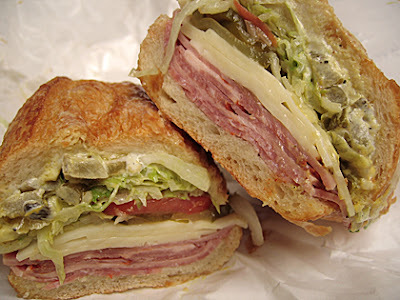 When I lived in Venice, there were many Sundays when the line at the deli inside Bay Cities was 30-45 minutes long and all of us in line were willing to wait for sandwiches -- the best sandwich, in my opinion, however is the Godmother. Served on their fresh french bread, the base sandwich consists of Genoa salami, mortadella, coppacola, ham, prosciutto, and provolone -- no substitutions are allowed and if they description of ingredients got your mouth watering, you'll know why. Following the base sandwich, you can add the normal fixings, but most get it with "the works", which consists of mayonnaise, your choice of mustard, onions, pickles, tomatoes, lettuce, Italian dressing, and you choice of mild or hot pepper salad. A word of warning: if you get the sandwich with the works, eat it within 15 minutes or so of it being assembled or all of the amazing oils will begin to make the bread mushy; not that it tastes bad, but it may cease to function in the classical sandwich manner (i.e., you might need a fork and knife). Due to the popularity and potential length of line, it was always challenging for me to grab a sandwich on my way out of town. However, Bay Cities now has online ordering, which is amazing. Allow me to note that this is not automation for automation's sake -- the automation in this process truly solves a problem for customers like me that know exactly what they want: I can get in and out without waiting in line. To support the online ordering, they carved out a corner of the store well away from the normal deli line that only fulfills online orders and catering orders. I will admit that the online ordering system is rudimentary (i.e., not very fancy), but it works and it works easily on my iPhone. Just log on to the site, put in your order, and they'll make it; you need to give them 45-60 minutes (they won't even talk to you about your order not being up if it hasn't been 60 minutes since you ordered). Once you arrive, you stand with the rest of the people that have ordered online and sift through the orders on the gorilla rack -- they just print out the order sheet and wrap it around the sandwich, so look carefully for your e-mail address. I was just in LA last Sunday, placed an order on my iPhone during brunch, ran into the store while my friend waited in the alley (far enough away for the parking guy to not yell at him), ran up to the rack, found my sandwich, and was out in less than 5 minutes. The sandwich that I brought on the plane only had mustard, lettuce, and pickles on it because, to be honest, everyone on the plane starts drooling with the smells coming off just the base sandwich; if you load it up with the works, you will assuredly send the smell of all that stuff throughout the entire plane air system in addition to the complications you may face with the sandwich getting mushy from all the oil. If you live in LA, it's definitely worth a trip; if you're traveling through and flying out of LAX, bear in mind you can swing by, hop on Lincoln, and take Lincoln straight to the airport.